Well, it's my first post from Boston. How do I feel? Completely liberated. As imagined, I am still on the job hunt, but I know that time will unfold my path. I'm pumped. Before I left, a big group of my friends got together at my house for one last hurrah. Of course, we just insisted on making almost everything. Was it delicious? Yes. Was it very time consuming? Yes. But all in all, totally worth it. If you're looking to host a cocktail party, I will be posting several recipes in the next few weeks. Get inspired! 1. Preheat oven to 350 degrees. Lightly grease a small baking dish. Meanwhile, in a medium bowl, mix together cream cheese, mayonnaise, Parmesan cheese, Romano cheese, garlic, basil, garlic salt, salt and pepper. Gently stir in artichoke hearts and spinach. 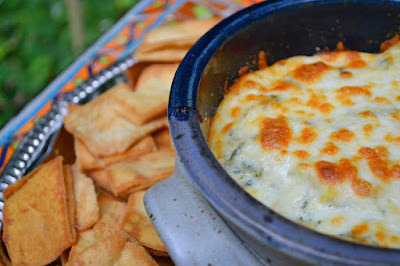 I love spinach and artichoke dips. I especially like the addition of the Romano cheese in this. Extra special yum. Wishing you much luck on the job hunt. Best wishes to you in your new adventures, and thanks for sharing this recipe, I just saved it to try for our next party! My favorite dip, hands down. Great recipe!! Congrats on the move... this dip is definitely a great send off! this looks soooo delicious! I might make it at the beach for my family in a couple of weeks. Hope you're having a great time in Boston!! I saw this recipe on allrecipes.com a few months back and have been wanting to try it since. Now I think I'm going to have to! Go Bruins!